It’s time to give you a little sneak peek in my life. My week started bad, but it ended special. Because I was for 24h in the cinema. This was so weird but also special! And I would do it again for sure! Curious what else I did this week? Meh, it’s just like always, I start my week bad… But I had so much back pain that I forgot to take photos. And because it was that worse I sat whole the evening on a massage chair… Oh, but something that was great that day was that I was on the television. I had a small part in a series ‘buurtpoltie’. I forgot to take a picture from it, but next week I will share it will you! Wednesday I made a video in Dutch, I tried out different Japanese snack and candy. After that I went to the hospital to visited someone from my family and when I was back home my boyfriend made me a lovely pasta! Thursday it was a rush for me to get in time in Antwerp for the fashion retail evening. It was so interesting and I always forget how beautiful Antwerp is at night. After an interesting night I was craving ice cream… And I tried out this raspberry magnum cup. And just woow, it’s so good! After a busy day, I had dinner with one of my best friends! I toke a veggie wok and this was the huge plate I got. It was so good, but in the evening I was so sick from the food…. Yesss, Saturday was a special day! 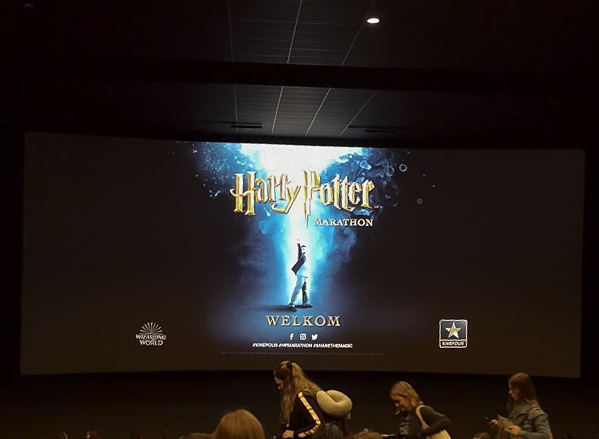 Because Saturday morning we went to kinepolis Antwerp for the Harry Potter marathon. 24h in the cinema. Crazy, but so cool! And between all the movies I tried the famous butterscotch beer, so sweet and special! This week I don’t have special plans, so we will see what this week will bring to me!